Arizona Termite Specialists, is not your general pest control company. We are highly trained and experienced termite professionals with over 20 years experience serving Arizona homeowners. At ATS we strive to provide our customers with unmatched service at a fair price utilizing only the best products on the market. The gentleman who treated my home was punctual, curious, and knowledgeable about the service he performed on my house. Professional and friendly! They were able to promptly provide me with a next day appointment at an affordable cost and answered all my questions! Excellent service. Just as promised. Fast, friendly service. Was able to get someone out here quickly & get a quote & then getting the treatment done was very quick. The technician was very friendly & knowledgable. The inspector who came out to my home was quick, courteous and was able to adress the termite issues I was having quickly and at a great price! Prompt courteous service with a solution provided on day one. Very satisfied with the service provided and the warranty provided. Absolutely excellent...... from Jeremy to Heath and Robert! I have been in real estate for many years and they are top-quality. I will recommend them to everyone! Heath did a great job. termites have not been seen since. ty. Treatment was done professionally and on time. Courteous and explained everything they were going to do. Termites are gone. We're truly pleased with the both the inspection and treatment. Both Heath and Robert were professional, pleasant, and very easy to work with. They were happy to answer any questions and accommodate our needs. The cost of the treatment is quite fair, and we can assuredly recommend them without reservations. I was happy with your service. The technician was thorough and he replaced all of the gravel around the house. Great job Robert and Heath - Keep those bugs at bay. Jeremy and Robert provided great customer service and we will definitely recommend this company to any friends or neighbors in the future! Very pleasant and on time for appointments. Everything is explained clearly too. As a landlord, I appreciate that they are willing to work directly with my renters for scheduling. The serviceman was good at explaining the process and warranties.. The service was scheduled very quickly!! Guys did well. No sign of the little critters after treatment. Thanks. Was very thorough. Answered all our questions and gave us good suggestions. Thank you for your prompt service. Prompt response to inquiry. Explained process thoroughly. Would highly recommend. This is a great company to do business with. I will use them for all of my termite needs. There employees are the best, on time or early for appointments. I am very happy with their service. From Jeremy, Heath, and Robert, all are great people to work with. Thank You for a job well done! Prompt response setting up appointment, evaluation and treatment. Reasonable Pricing and great customer service! Very professional and promot. Kept us informed during the whole project. Efficient, clean, professional & a good value! Would recommend to anyone looking for a hastle free experience. 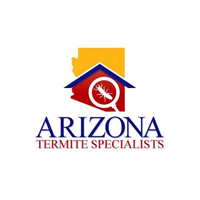 From first call to clean up Arizona Termite Specialists were very polite, professional and informative answering all of my questions and did a thorough job. Great company to work with! We had a termite problem and they sent a sales rep out the next day. They gave us a proposal and the technician was here the following week to do the treatment. On time, great service, and everything was put back in place. Great, reliable and honest people! Very professional and treatment seems to be working! Hopefully the termites are gone. Very nice technician and an excellent job. Hardly knew he was there.